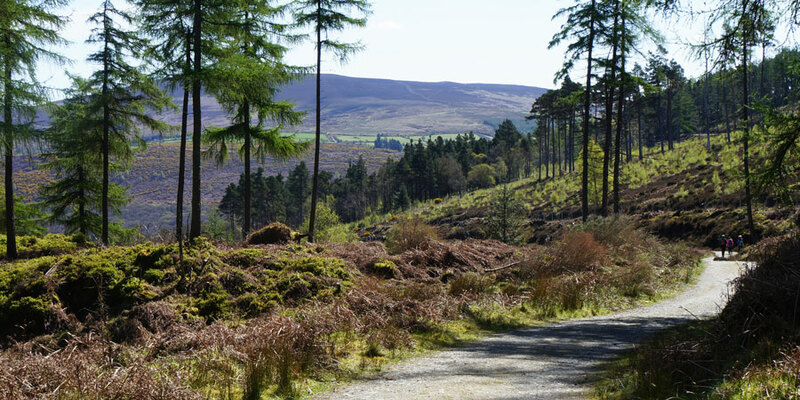 Nature and history are beautifully intertwined in Glendalough, one of the most special stops for hikers on the Wicklow Way trail. As well as spectacular scenery, Glendalough is home to one of Ireland’s most impressive monastic sites. 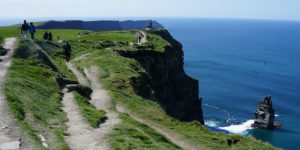 It was here that St Kevin founded a monastic settlement back in the 6th century, a place where he could retreat from the world. It is believed St Kevin lived as a hermit in a cave by the Upper Lake. St Kevin’s Early Christian settlement would eventually become an important ‘Monastic City’ in Medieval Ireland. Glendalough attracted pilgrims, monks and scholars over the centuries. The monastic settlement was attacked, burnt and ransacked many times first by the Vikings and then by the Normans; and it was eventually destroyed by English forces in the 14th century. Many of its beautiful stone buildings luckily survived the raids and turmoil and today we can wander the fascinating ruins in Glendalough and imagine the splendour of the city’s medieval heyday. Nestled in the heart of the Wicklow Mountains National Park, the tranquility and peace that St Kevin looked for in Glendalough can still be found in this picturesque valley, known in Irish as Gleann da Locha or ‘Valley of the two lakes’. 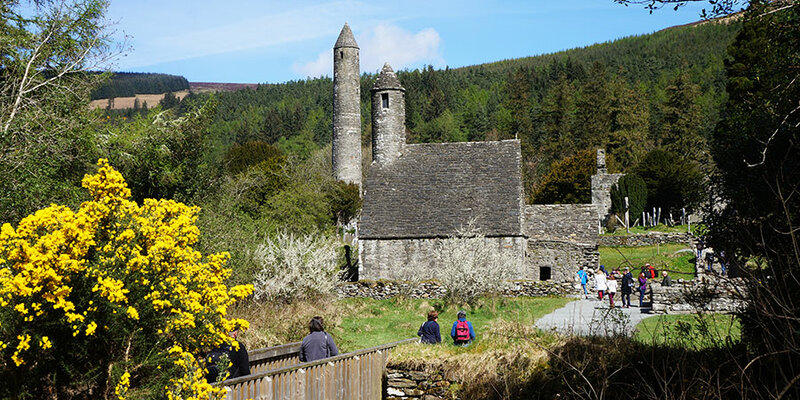 The 33 metre tall round tower is Glendalough’s most iconic landmark. 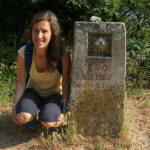 It was built by the monastery’s monks to serve as a lookout point but also as a shelter when under attack. 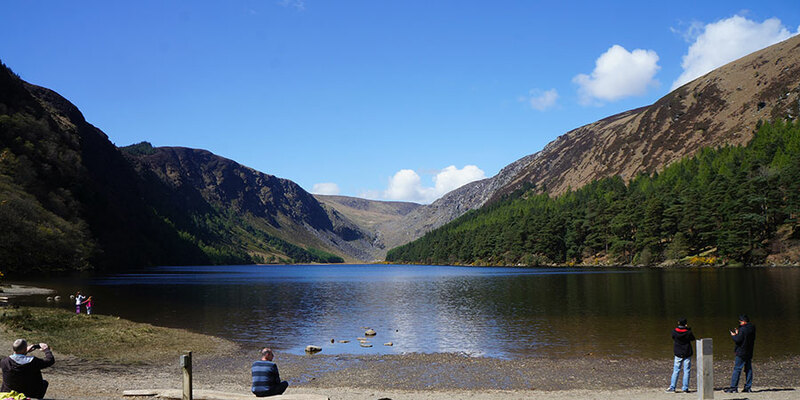 There are two lakes that give Glendalough its name: the Lower Lake and Upper Lake. The cathedral is the largest of the remaining medieval buildings, built between the 10th and 13th centuries. This is the name given to St Kevin’s Church or St Kevin’s oratory with its unique stone roof. The cemetery in Glendalough is dotted with impressive stone crosses, including St Kevin’s cross. According to a local legend, if you manage to wrap your arms around St Kevin’s Cross fully and touch your fingertips you will have your wishes granted. It is definitely worth a try! 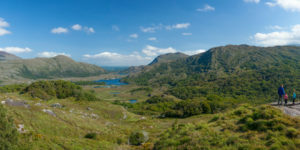 At the Glendalough visitor centre you will find out about the interesting history and heritage of the area; as well as the flora and fauna of the National Park. 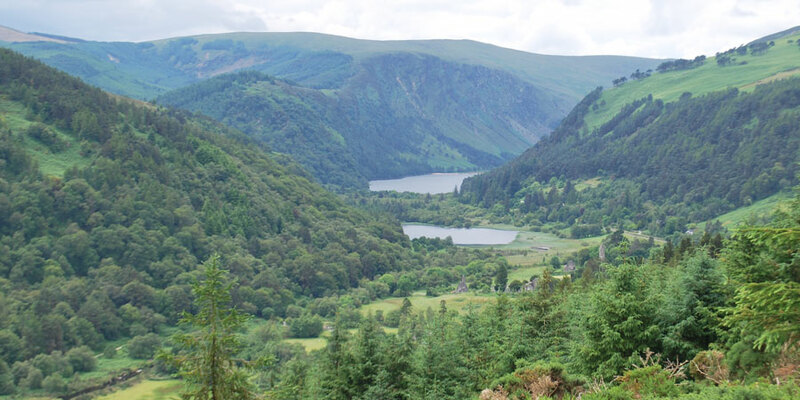 For more information about Glendalough, hiking the Wicklow Way or to book your trip, contact our travel specialists.